elastic, midweight woollen fabric, which has a fine lustre, and is slightly stiff, even sharp to the touch. 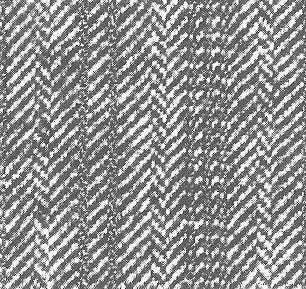 Has a bright look given by its (typically broken) twill weave , which forms its characteristic herringbone pattern. Produced from single and twisted, medium-fine carded or coarse worsted yarns. Used in men's suits, and ladies' suits and lightweight coats. The name is given by the Cheviot sheep, from whose wool the fabric is procured.